Fruit juice is a popular drink among kids, and parents love them since they provide hydration and fruit servings (especially for picky eaters who reject whole fruits). But even though juice is natural and made from fruits, is it a drink that should be given freely without limits? Fruit juice was allowed in moderation starting at 6 months of age, but the American Academy of Pediatrics has just recently published a change in recommendations, suggesting new guidelines for juice consumption starting until after a year of age. Juice consumption is notorious for filling children’s bellies and therefore replacing other solid foods or breastmilk/formula which babies need the most. 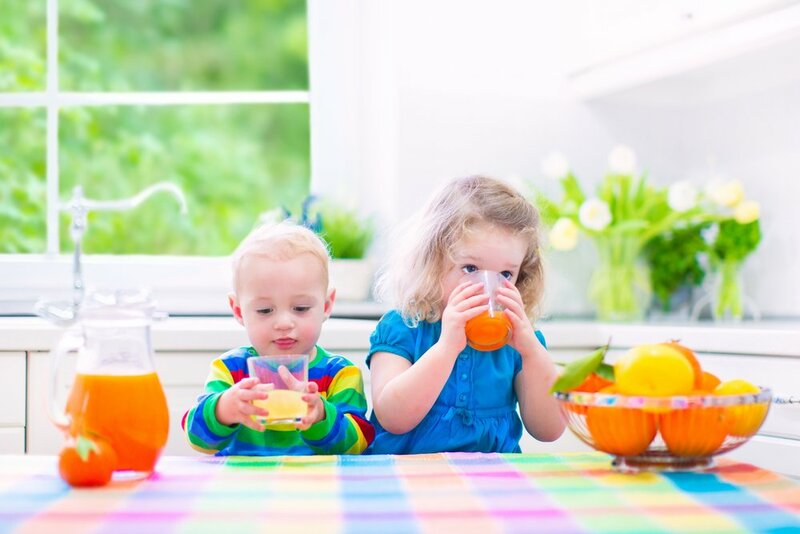 Although 100% fruit juice with no added sugar provides nutrients, it’s very high in sugar and low in fiber, putting children at risk for high-calorie consumption and tooth decay. Whole fruit is always better than juice, and if kids consume fruit, there is no need for fruit juice in their diets. Before age one, 100% fruit juice offers no nutritional benefit for babies. Once children turn one they can consume some juice to complement a balanced diet, but it should be limited according to their age. If you want to feed your baby fruit juice make sure to follow the recommendations below. Don’t use a sippy cup to be consumed all throughout the day; the constant exposure to sugar can lead to tooth decay. Don’t give fruit juice during bedtime, this also can contribute to the appearance of cavities. Fruit juice is not necessary for a healthy diet. Breastmilk/formula for infants and cow’s milk or water for children from age one and beyond is sufficient. If you’re serving fruit, make sure it has no added sugar. Avoid giving grapefruit juice if your child is taking medication, it can reduce its effectiveness. Although fruit juice is commonly used as a home remedy for dehydration, constipation, or diarrhea, it’s not the appropriate treatment. Instead, contact your pediatrician. How to ignite bilingual learning!